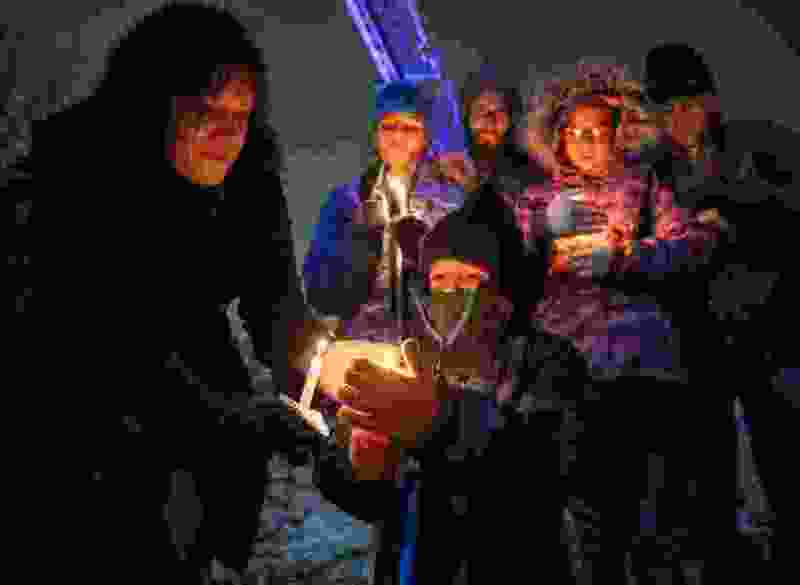 (Keith Johnson | Special to The Tribune) Tiffany VanZeben lights the candle of her grandson Emery Romrell (6) during a candlelight vigil Dec. 2, 2018, at the Columbus Community Center in South Salt Lake for Officer David Romrell, a South Salt Lake police officer killed in the line of duty Nov. 24, when he was struck by a car driven by a fleeing suspect. Several hundred members of the community attended the vigil including family, friends, South Salt Lake Mayor Cherie Wood and representatives from the Utah Highway Patrol, Unified Police and Unified Fire. 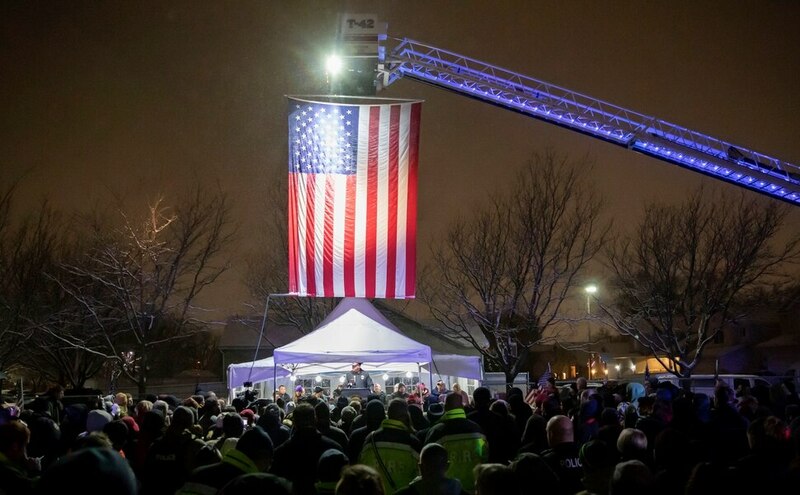 Hundreds turned out on a cold and snowy Sunday night for a candlelight vigil at the Columbus Community Center to honor David Romrell, a South Salt Lake police officer who died after being struck by a car during a clash with two burglary suspects. 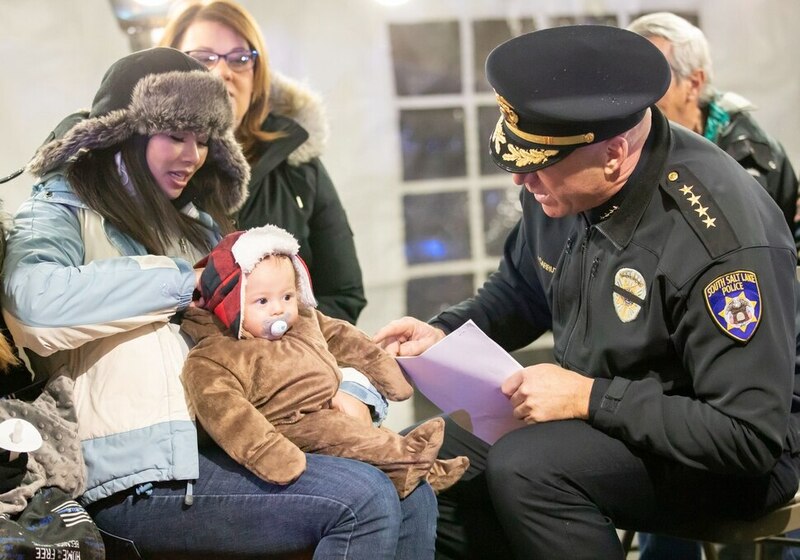 (Keith Johnson | Special to The Tribune) South Salt Lake Police Chief Jack Carruth addresses the crowd gathered for a candlelight vigil Dec. 2, 2018, at the Columbus Community Center in South Salt Lake City for Officer David Romrell, a South Salt Lake police officer killed in the line of duty Nov. 24, when he was struck by a car driven by a fleeing suspect. Several hundred members of the community attended the vigil including family, friends, South Salt Lake Mayor Cherie Wood and representatives from the Utah Highway Patrol, Unified Police and Unified Fire. (Keith Johnson | Special to The Tribune) South Salt Lake Police Chief Jack Carruth talks to Liz Romrell and her son Jackson (4 months) before a candlelight vigil Dec. 2, 2018, at the Columbus Community Center in South Salt Lake for Liz's husband, fallen Officer David Romrell, a South Salt Lake police officer killed in the line of duty Nov. 24, when he was struck by a car driven by a fleeing suspect. Several hundred members of the community attended the vigil including family, friends, South Salt Lake Mayor Cherie Wood and representatives from the Utah Highway Patrol, Unified Police and Unified Fire. (Keith Johnson | Special to The Tribune) Tiffany VanZeben lights the candle of her grandson Emery Romrell (6) during a candlelight vigil Dec. 2, 2018, at the Columbus Community Center in South Salt Lake for Officer David Romrell, a South Salt Lake police officer killed in the line of duty Nov. 24, when he was struck by a car driven by a fleeing suspect. Several hundred members of the community attended the vigil including family, friends, South Salt Lake Mayor Cherie Wood and representatives from the Utah Highway Patrol, Unified Police and Unified Fire. (Keith Johnson | Special to The Tribune) South Salt Lake Police Chief Jack Carruth hugs the mother of Officer David Romrell during a candlelight vigil Dec. 2, 2018 at the Columbus Community Center in South Salt Lake for Officer Romrell, a South Salt Lake police officer killed in the line of duty Nov. 24, when he was struck by a car driven by a fleeing suspect. 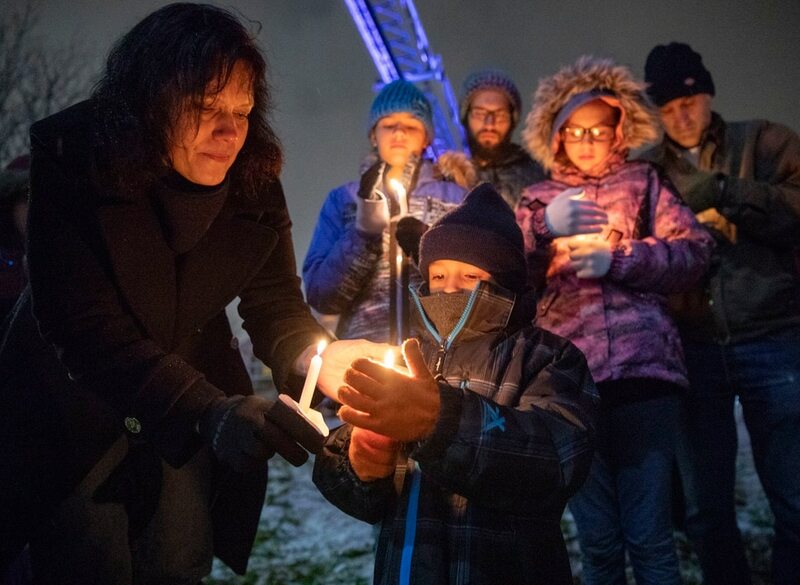 Several hundred members of the community attended the vigil including family, friends, South Salt Lake Mayor Cherie Wood and representatives from the Utah Highway Patrol, Unified Police and Unified Fire. Unified Police Department investigators will meet with prosecutors Monday afternoon to discuss formal charges against Jeffrey Black, who was in the passenger seat of the Chevrolet Impala that hit Romrell on Nov. 24. The driver, Felix Calata, 31, was killed that night when police opened fire on the car. Black, 43, was initially interviewed and released. He was arrested Monday, Nov. 26, and is being held in the Salt Lake County jail. When he was arrested, Sgt. Melody Gray of Unified police said Friday, Black faced a possible charge of aggravated murder, because Romrell’s death happened during the commission of a felony. Gray said Black also could be charged with burglary of a dwelling, obstruction of justice, three counts of failing to stop at the command of a police officer, interfering with an arresting police officer, and aggravated assault. Funeral services for Romrell are set for Wednesday at the Maverik Center, 3200 S. Decker Lake Drive, in West Valley City. A viewing will take place from 9 to 10:30 a.m.; the funeral service will begin at 11 a.m. After the funeral, a procession will take Romrell’s casket to Larkin Mortuary, 1950 E. Dimple Dell Road, Sandy. Tribune reporter Sean P. Means contributed to this article.